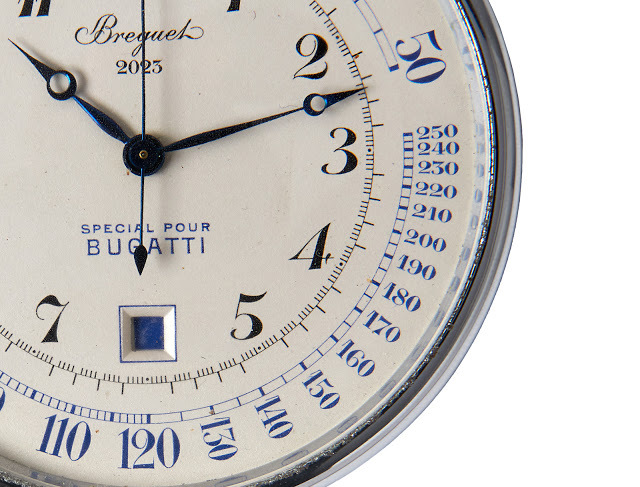 Breguet recently acquired for its museum a dashboard chronograph originally intended to be installed in the Bugatti Type 41 “Royale”, once the most expensive automobile in the world. 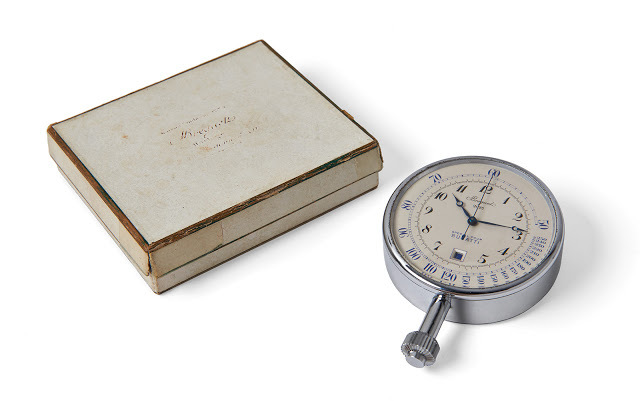 Delivered to Bugatti in 1932, the dash-mounted clock was one of nine such timepieces Breguet made for the French carmaker in the early 1930s and is now destined for the Breguet Museum. These were intended to be fitted to the centre of the steering wheel of the Bugatti Type 41, a monumental car best known as the “Royale”. More than 20 ft long, the Royale once held the record as the most expensive ever sold when one changed hands for over US$15 million. Conceived by Ettore Bugatti in the late 1920s as the best car in the world, the Royale sold poorly in the midst of the Great Depression, with only three of the six produced finding owners. It appears that the Breguet clocks never made it into the cars. 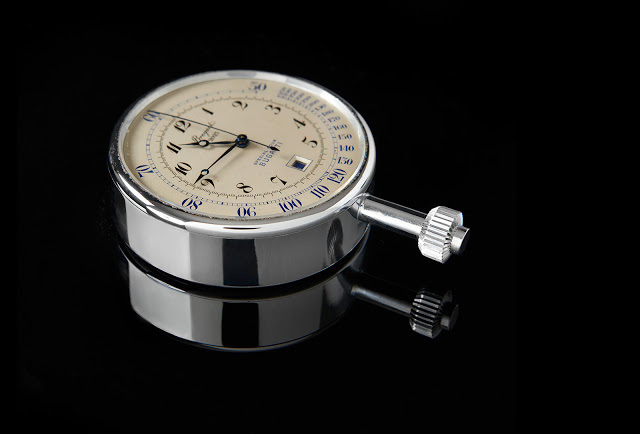 Made of chrome-plated brass and 67 mm in diameter, dashboard clock no. 2023 includes a stopwatch function, with a central elapsed seconds hand as well as a minute counter in the window at six o’clock. 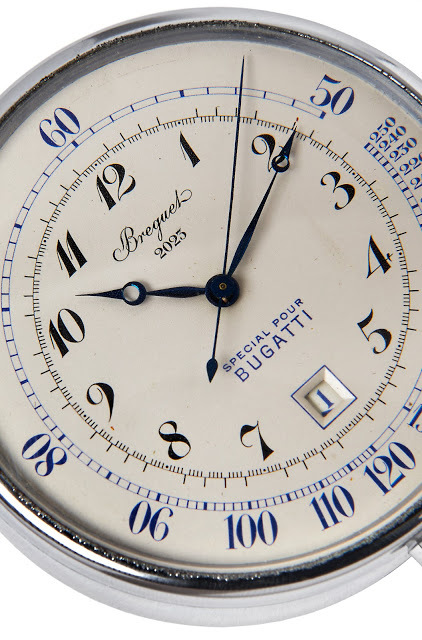 Elegant but exceedingly functional, the dial is vintage Breguet, with the brand’s namesake hands and Arabic numerals, along with “Spécial pour Bugatti” at six o’clock. On the perimeter of the dial is a tachymeter scale that can measure the speed of a moving object over a known distance. The movement is hand-wound with an eight day power reserve, meaning the chauffeur (who did not have a roof over his head in certain Royale models) only had to wind it on Mondays. In the early 1990s the Royale clinched the title of the most expensive car in the world, when one sold for over US$15 million to a Japanese engineering corporation. Like many other records set during the Japanese bubble economy, it faded away. Breguet, on the other hand, bought the dashboard chronograph no. 2023 at an auction on February 6, 2016, held on the last day of the Rétromobile Exhibition vintage car show in Paris. Including the buyer’s premium the bill was €78,000, or about US$86,000. And the clock was even accompanied by its original box.